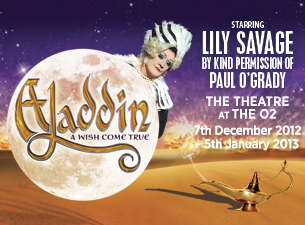 This Christmas the O2 has staged its first-ever pantomime under the tent with Lily Savage leading an all-star cast production of Aladdin A Wish Come True in a new purpose-built theatre. The performances between 7 December and 5 January 2013 will see the inaugural use of the theatre space at The O2. It has been created to further diversify attractions at the venue in addition to the world-class live entertainment already available. Appearing by kind permission of Mr. Paul O’Grady, Lily Savage will perform as Widow Twankey on a proscenium arch stage in front of 1,900 seats adjacent to the bars and restaurants of The O2’s Entertainment Avenue. Former S Club 7 member Jon Lee will play as Aladdin with legendary theatre impresario Michael Rose producing the show. Isla and I went together, we were all meant to go but Noah was poorly so stayed at home with Daddy. Isla loves a good show, so I had high hopes that she would love this one too. We arrived at the O2 (which we've been to before for In The Night Garden and loved it there) and collected our tickets with ease and entered the newly erected theatre tent. The staff were really friendly and we were able to leave the buggy in the foyer. Although it is a pop up theatre it had all the facilities and it was also very warm in there (almost too warm). It had all the usual refreshments to buy and a few promotional things - I got away lightly by only buying Isla a flashing ring for £2. We took our seats (it's worth mentioning that the seats aren't your usual theatre seats - they are the plastic ones you usually get in a music gig - but they've added a little cushion to try and make the performance more comfortable to sit through) and waited for the show to begin. And it began with a funeral in Birkenhead - not what you'd expect in a panto, but it set the story well. Widow Twankey is left a launderette in Old Peking in her late husbands will and from the land of the Scouser we are transported to the Orient! I loved Lily Savage in this production. I felt like this was a panto that appealed to adults and children - in fact I wasn't expecting to see groups of adults watching a panto without children - but it does happen it seems! The only thing I would say is that the bits that Isla (who is 3 and a half) didn't like were the bits where Lily Savage was doing her own solo bit - there was about 10 minutes of this at one point that I was thoroughly enjoying but Isla wasn't so bear this in mind. That said there was plenty that Isla did like about it! Her favourite bit of all was the magic carpet scene where Aladdin seems to fly out above the audience, there were no obvious mechanics so she really did think it was flying. She also seemed to really like Aladdin, played by ex-S Club 7 band member Jon Lee and I have to say that his singing was superb! He was so enthusiastic and made a great Aladdin. The other great thing about the Panto were the references to other well known films/ songs that Isla could make a connection with. For example Aladdin and the Genie of Abanazar's ring sing a fabulous rendition of 'You got a Friend in Me' from Toy Story - a song that Isla loves. It was also obvious to me that Widow Twankey rather resembled Miss Hannigan from Annie and no sooner had I thought it the younger members of the cast in one of the scenes say 'We Love You Mrs Twankey' in the same way the orphans say it in Annie. Again this is another of Isla's favourite films and a show that we must see when I ever notice it touring! All in all we had a very enjoyable afternoon. In summary the cast were great, including the children. The appearance of the Genie to Pink's 'Get the Party Started' was probably my favourite bit - great voice and staging. The dancing in the show was top notch. 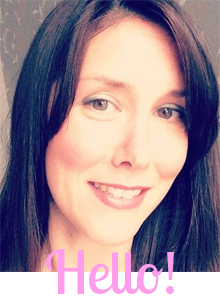 I'm a big Strictly Come Dancing fan and it tapped into that for me and helped me mourn the loss of it from my weekend! The orchestra were amazing - watch out at the beginning though for a very sudden blast from the brass instruments where Isla nearly jumped out of her skin! If you've still got some time on your hands over the holidays then I fully recommend a visit to this Panto, it's great for all the family.